If a city person asks you if it will rain tomorrow, you couch your answer based on the likelihood of their plans being ruined. If a country person asks, you answer based on how dry or wet it is, and if we need rain or a break in the rain to get some field-work done. We were getting dry, but it was moist enough for my sweet corn to germinate. It was coming out of the ground about a week after I planted. I rotovated a second time, then planted. The second rotovating pretty much took care of the rye. Unfortunately, whatever alleopathic properties the rye had also seemed to dissipate. About a week after planting I could see small button weeds shooting up. So I took the rotary hoe, pictured, and ran it over the field. It took some of the weeds out, but not all. Then we had some rain. Yesterday I could see more weeds, (pigweed, lambsquarters, and foxtail), poking out of the ground. 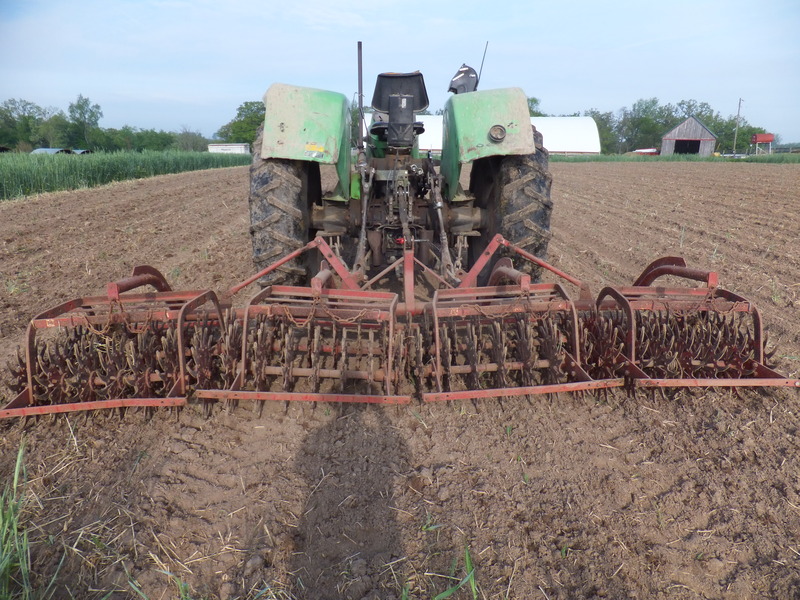 I read online that you can rotary hoe until the corn is six inches high without much damage. So I rotary hoed a second time. It took out more weeds and didn’t damage the corn. I’ll probably have to switch to cultivation between rows for weed control next. My sweet corn is coming up uneven. I dug and found some of the plants struggling to come out of the ground. I think the ground was so mallow after two rotovatings I ended up planting too deep. I had reduced the depth from my Dad’s field corn, but apparently not enough. Sweet corn has a shrunken kernel when compared to field corn and it doesn’t appear to be as strong pushing itself out of the ground. Learning. This entry was posted on Tuesday, June 3rd, 2014 at 1:42 am and is filed under Curious crops. You can follow any responses to this entry through the RSS 2.0 feed. You can leave a response, or trackback from your own site. You must really have to drive your tractor straight to keep from hoeing up the sweet corn too. How big of a plot do you have of sweet corn and is it just for your own consumption or are you going to sell some too? Gordon, that’s the beauty of the rotary hoe, it covers the whole field. The theory is that the corn is planted deeper than the shallow-germinated weeds. The tines dig up the weeds, but just roll over the corn. At some point, the corn will get too big or brittle to not have damage, but like I said, so far it hasn’t damaged it. I don’t know if I’ll have courage to do it once more. I also have some squash and pumpkin planted and the rotary hoe did very little damage to those also. It’s about an acre. We’ll sell some, and hope to freeze a bunch for winter consumption.